The first thing that you notice when you pick up the Surface is how well designed it is. Surface is designed better than 90% of tablets on the market. Its body isn’t made of brushed aluminum like the iPad, but the black metal casing has it’s own beauty. The body is wider than an iPad when held in landscape orientation, which is nice because you have more screen real-estate, but it does feel odd to read off a 16:9 tablet in portrait mode. What I didn’t expect about the Surface was that it’s kind of heavy. It’s 2lbs when you’re carrying it around with the Touch Cover keyboard, which doesn’t sound like much, but when you’re used to the 1.44lbs of an iPad 3 you can actually notice a difference. Remember when the iPad 2 was announced and Steve was bragging about how a couple ounces of less weight make a big difference? Yeah, it’s kind of like that. Despite everything that Microsoft’s marketing team has tried to say to spin the display quality of the Surface, it’s definitely not as good as an iPad with Retina display. When you’re browsing the web or reading you will see pixels. The display looks great when you’re watching video, but after that you’ll be back to noticing the pixels. I never realize how beautiful Apple’s Retina displays are until I use a device that doesn’t have one, and the Surface’s display was just another reminder about why I love the iPad. 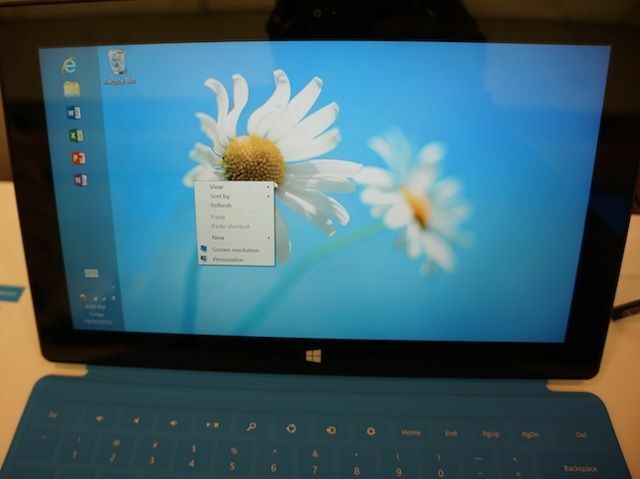 If you care a lot about expandability then the Surface is a much better tablet than the iPad. You can pop in an SD card, or charge your iPhone from the USB port. Then there’s the kickstand, which is a nice little feature. It pops out very easily and keeps the Surface steady whenever you want to work on some spreadsheets or watch a movie. Microsoft did a great job of making the kickstand blend into Surface when it’s not in use. 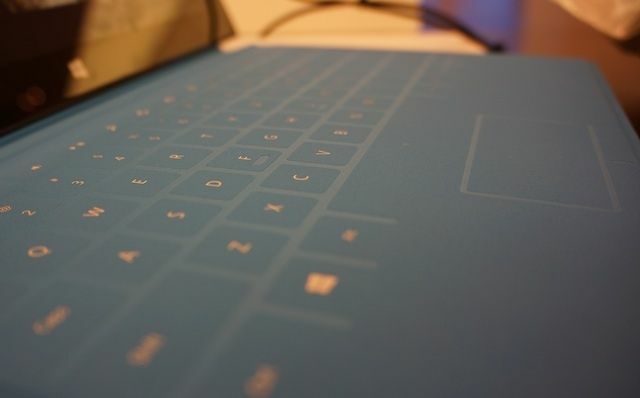 The most intriguing aspect of the Microsoft Surface is the Touch Cover keyboard. When the defining feature of your tablet is the keyboard you better nail it. Microsoft almost got it right, but not quite. The Touch Cover keyboard is interesting but typos erupt from it like lava from Mt. Vesuvius. It works a little bit better than I thought it would, but barely, and I don’t have the nearly the same typing speed while using it as I do on my Bluetooth keyboard that connects to an iPad. It’s difficult to get used to the amount of pressure to apply to the keyboard because there is no tactile feedback. You can’t float over the keys lightly or it won’t register your keystrokes, but putting too much pressure into a keystroke becomes jarring because you’re pounding onto a flat surface. The fact that the keyboard also acts as a cover is a really nice feature. After using the Touch Cover keyboard I’m hoping it’s something that Apple will steal and bring to the iPad. There’s also a trackpad built into the Touch Cover keyboard. If you ever get tired of gorilla arming it while the Surface is propped up on its kickstand, you can move your finger around on the touchpad and a mouse cursor will appear on screen so it’s like a laptop. The mouse cursor makes you feel like you’re using a regular old computer again, which seems like a bad idea on Microsoft’s part because it detracts from the magic of touching your data and living in a new world of gadgetry. The Surface runs a variant of Windows 8 called Windows RT. It has a desktop mode but can only run a very few number of actual desktop apps. It can’t run old Windows apps, unlike Windows 8. Even though I haven’t played with Windows 8 much, the Windows RT looks very similar to the full-blown version of Windows 8, which is both a blessing and a curse. I took a visit to my local Microsoft Store last night and sat at the Surface table while listening to customers ask retail staff about the device. Most people seem pretty confused about the software. One guy started getting very very confused as to why he couldn’t install iTunes on the Surface if it runs “Windows.” Other people asked about their favorite apps that run on Windows 7 and were disappointed to find out that it wasn’t available on Windows RT. Microsoft’s Windows RT operating system is going to confuse a lot of users because it looks so much like full blown Windows 8 even though it’s really not. Windows RT is to Windows 8 as iOS is to OS X. Except Apple’s done a much better job marketing their two OSes. With iOS and OS X, Apple has two distinct operating systems that do borrow some elements from each other, but you always know that when you’re on an iPad you’re not using desktop quality software. Illusions of Windows 8 are rampant in Windows RT when you’re using the Surface. You keep running into limitations that you aren’t expecting because everything looks similar to the new Windows desktop computing environment. Even though Microsoft is trying to pitch the Surface as a tablet that is completely different than an iPad – because its software is more advanced and it has a cool keyboard and kickstand – there’s not enough of a desktop computing type feel behind the Surface and its software to make you lust after it. You can run Office, but you can’t play great games. You can surf the web but there’s no magazine quality news apps. Windows RT’s Metro interface for the Surface is extremely cool. Microsoft has done a heck of a job trying to come up with a new user interface design that feels like the future is here. It’s more minimalist than iOS but information is more immediately available on a Surface verses the iPad. One of the biggest problems that Surface faces is getting an ecosystem of apps that can rival iOS. During the iPad mini keynote, Tim Cook bragged that the iPad now has 250,000 apps on the App Store. 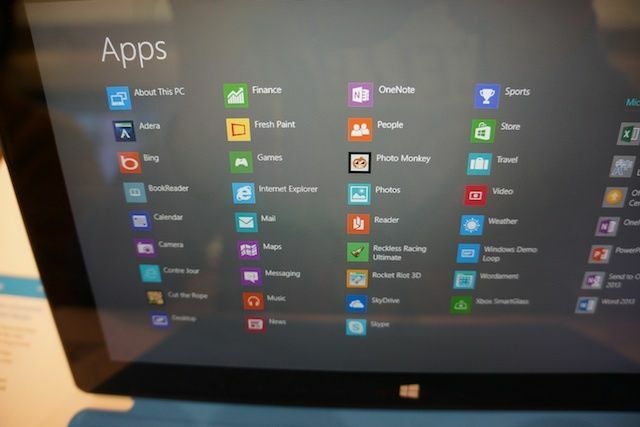 When you’re looking for apps for the Surface, it’s readily apparent that there’s not as much selection as on an iPad. The Windows Store couldn’t even fill out a “Top 100 Free Games” section, because there were only 91 free games available. No. Not yet at least. Surface feels futuristic. It can morph from tablet to laptop in seconds but it doesn’t perform great as a tablet or a laptop. It’s not truly great at a few things like the iPad, so there’s no compelling reason to get one yet. There’s a lot of potential in Surface, but it usually takes Microsoft a few tries to get hardware right, and we think that’s also going to apply with Surface. Physically, Surface looks a lot like a tablet and a little bit like a laptop. But in terms of software and performance, Surface feels like a crippled netbook, while the iPad comes across as the beefed up superhero of the iPhone. We’re really excited to see Microsoft competing in the tablet space, but their software and ecosystem needs a lot of work before people ditch their iPads for a Surface. Microsoft Surface does enough to get you excited about the future of computing, but it can’t deliver it. iPad users are amazed that their device can do so much despite its tablet form factor. Surface users are going to feel disappointed that their device can’t do as much as they dreamed of, despite its laptop-like features. For the Surface to beat the iPad, Microsoft must convince developers to bring their apps over, otherwise consumers are just buying a beautiful slab of metal and glass that does absolutely nothing other than run Microsoft Office. Great design must be accompanied with truly amazing functionality, and the Surface looks good, but the coolest thing you can do on it right now is update a spreadsheet in Excel or watch Netflix. Microsoft Surface does enough to get you excited about the future of computing, but it can’t deliver it. It’s more like an appetizer that’s priming you for the main course – the Surface Pro. Except when the appetizer isn’t satisfying, yet costs as much as the main course should, who’s going to want to wait around for more?